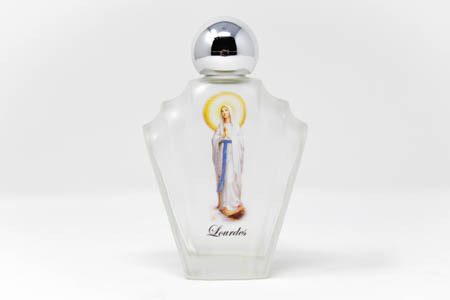 CATHOLIC GIFT SHOP LTD - Our Lady of Lourdes Vial / Bottle. Our Lady of Lourdes Vial / Bottle. Lourdes water in a colour glass bottle with a picture depicting Our Lady of Lourdes. This bottle measures 10 cm tall (3.9 inches) and holds 45ml (1.5 US fl oz) approx.